Arsenal manager Arsene Wenger says his side have no "cheap excuses" regarding a lack of preparation time for Saturday's game at Chelsea. Their Premier League game at Stamford Bridge kicks off at 12:45 BST. The Gunners were beaten in Croatia by Dinamo Zagreb in the Champions League on Wednesday, the same day the Blues beat Maccabi Tel Aviv at home. "I don't use that as an excuse," said Wenger. "I believe we are in a position where we can perform." Wenger made six changes in Zagreb as he dropped keeper Petr Cech, left-back Nacho Monreal, midfielder Francis Coquelin and forward Theo Walcott to the bench, while midfielder Aaron Ramsey and right-back Hector Bellerin were not in the squad. Ramsey and Bellerin are back in contention to play Chelsea, while Wenger says he has yet to decide whether Olivier Giroud, who was sent off in Croatia, or Walcott will start. "I stand up for my selection and take responsibility for it," added the Frenchman. "I believe we can repair what happened. "We are on a good run in the Premier League and it is important now to look at that. "Every defeat hurts but every defeat is also an opportunity to respond in a very strong way." 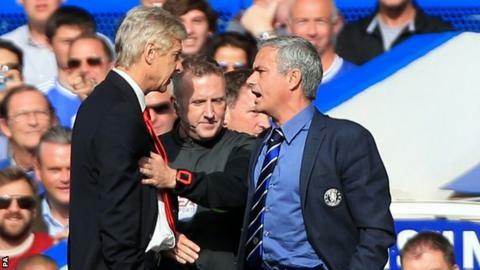 Wenger refused to go into his fractious relationship with Chelsea counterpart Jose Mourinho or the struggling start his 17th-placed rivals have had. "I do not consider too much where Chelsea stands at the moment and I'm focused more on us performing well with full power," he said.